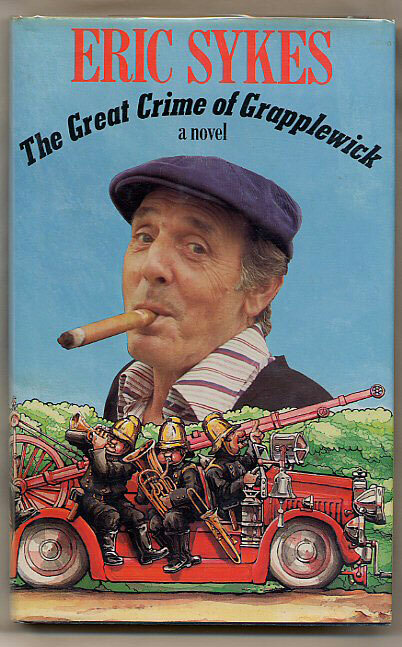 Published by Macmillan & Co. Ltd., 4 Little Essex Street, London First Edition 1984. 1984. First edition hard back publisher's original blue paper covered boards, gilt stamping to spine. 8vo 8¾" x 5½" 176 pages. ISBN 0333347803. Author's first novel. SIGNED by the author to front end paper. Tanning to page margins. Nr. Fine in Fine panoramic dust wrapper, not price clipped. Dust wrapper protected. Member of the P.B.F.A. 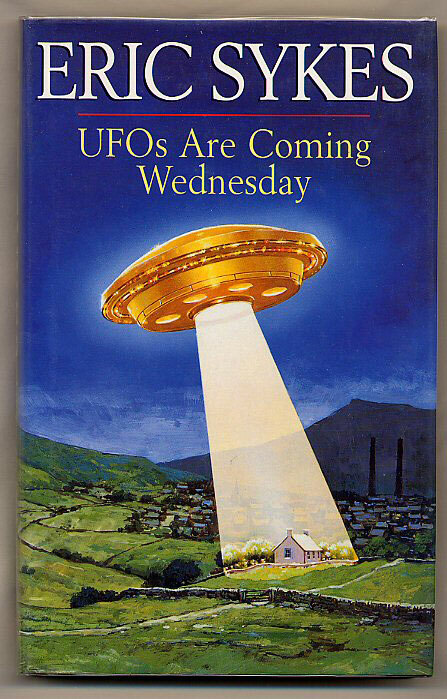 Published by Virgin Publishing Ltd., 332 Ladbroke Grove, London First Edition 1997. London 1997. First edition hard back binding in publisher's original black paper covers, silver lettering to the spine. 8vo 9'' x 6'' 220 pages. ISBN 1852276592. Fine condition book, in Fine condition dust wrapper, not price clipped. SIGNED by the author to the title page. Dust wrapper supplied in archive acetate film protection, this protects and prolongs the life of the paper, it is not adhered to the book or to the dust wrapper and can easily be removed should you so wish. Member of the P.B.F.A. 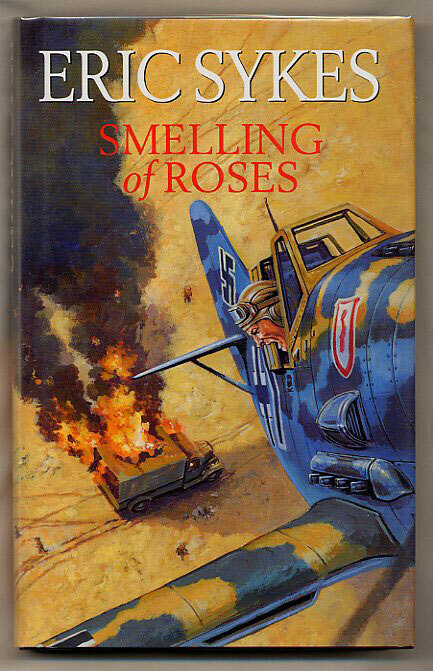 Published by Virgin Publishing Ltd, 332 Ladbroke Grove, London First edition 1995. 1995. First edition hard back publisher's original black paper covered boards, silver stamping to spine. 8vo 8¾" x 5½" 210 pp. SIGNED by the author to title page. Fine in Fine panoramic dust wrapper, not price clipped. Dust wrapper protected. Member of the P.B.F.A. PNE Video PNV1023 MCPS VFB 26094 1996. 1996. 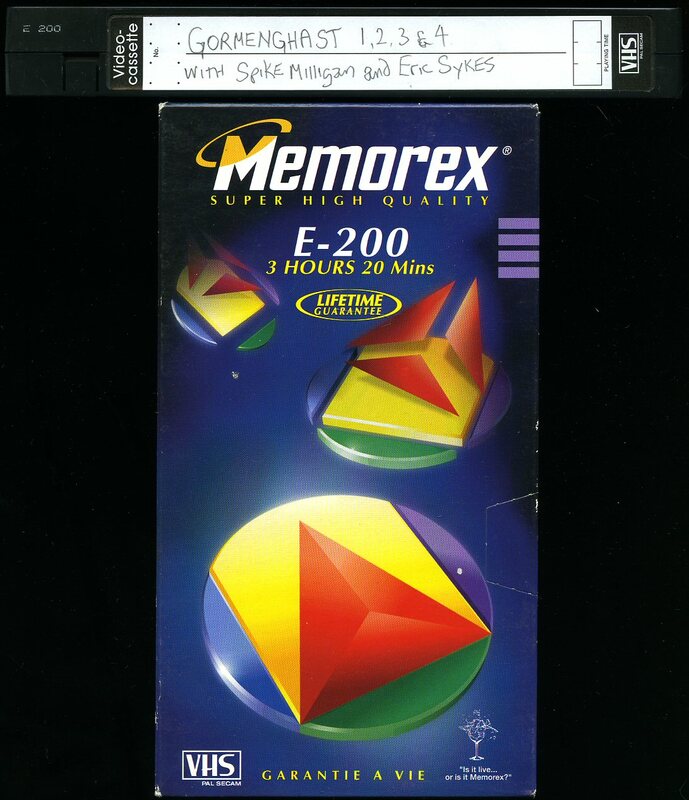 Original video cassette. 52 minutes running time. PG certificate. In Fine condition. Member of the P.B.F.A. Video cassette in card slip case, hand written title to spine of cassette. In Very Good condition. Member of the P.B.F.A. 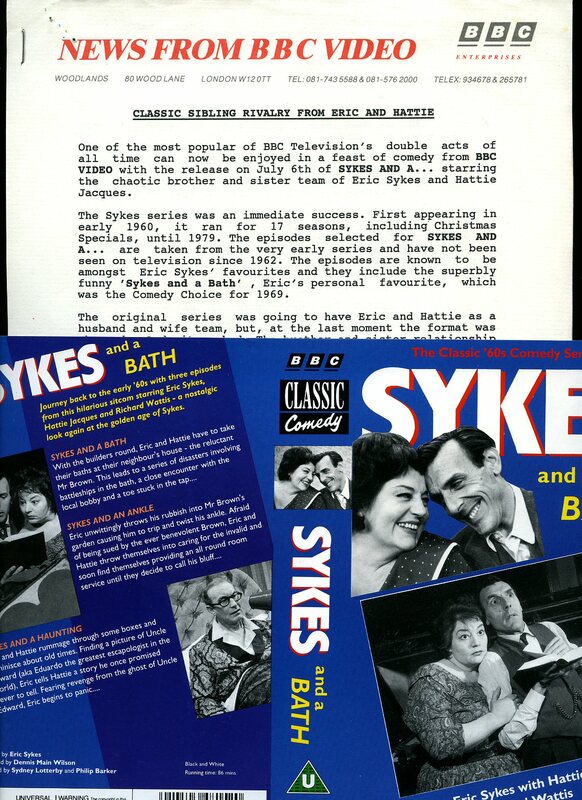 BBC Classic Comedy 1992. 1992. 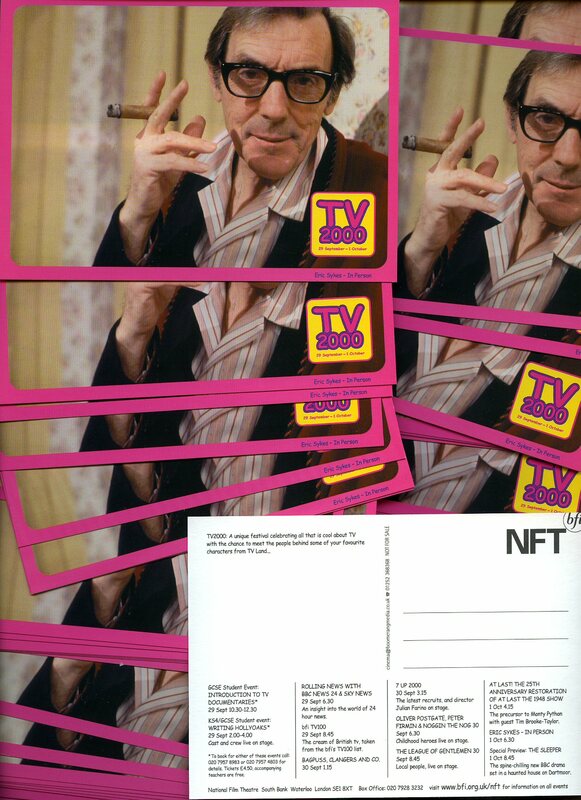 Promotional full colour video slip and 2 pages. newsletter from the BBC. In Fine condition. Member of the P.B.F.A. 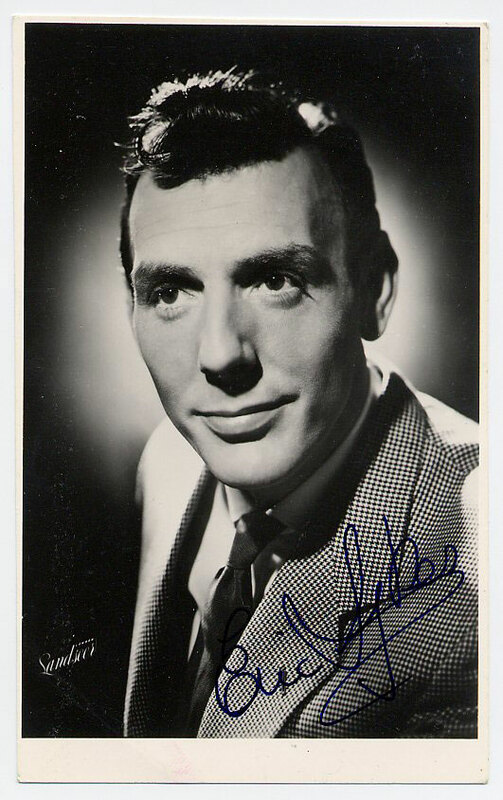 Published by London Palladium, circa 1960 edition not stated. 1960. Souvenir folio brochure 11¾" x 9", and promotional flyer 6" x 9". 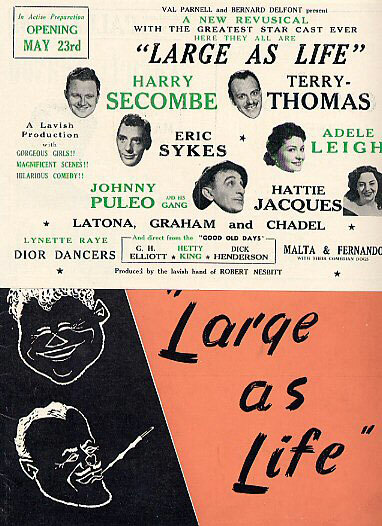 Also starring : Terry Thomas, Harry Worth, Hattie Jacques, Johnny Puleo and others. Well illustrated. In Very Good clean and sound condition. Member of the P.B.F.A. 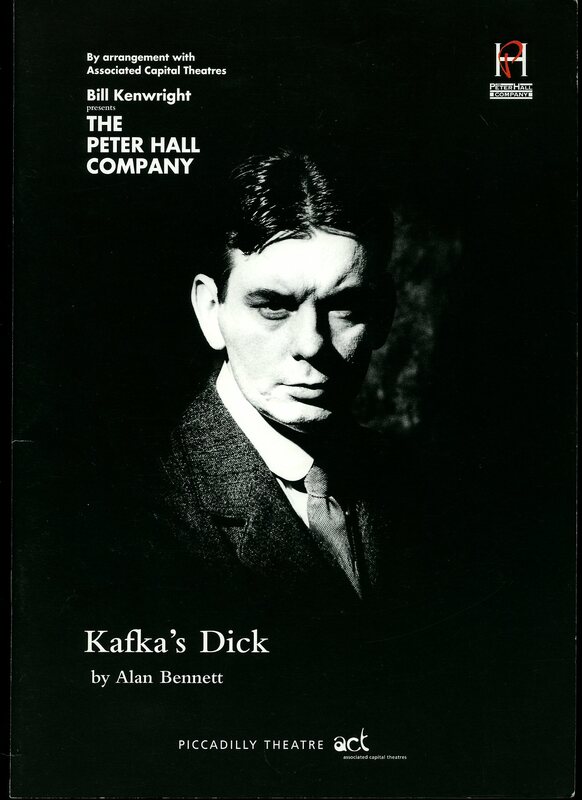 Published by Piccadilly Theatre, London Thursday 19th November 1998. 1998. 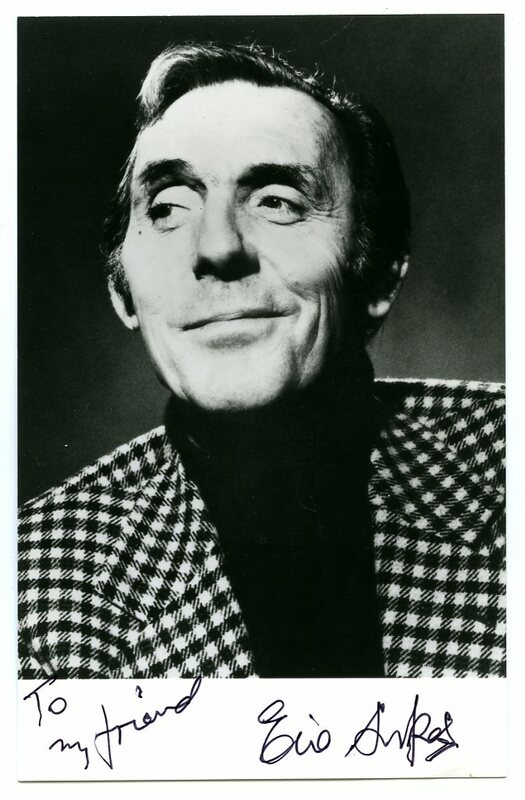 Souvenir theatre programme. Folio 11¾" x 8¼". In Nr. Fine condition. Member of the P.B.F.A. 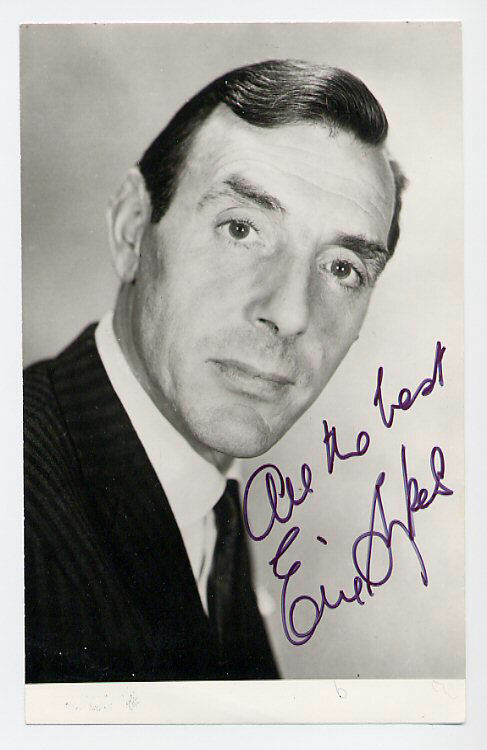 48 copies 4" x 6" colour postcard of Eric Sykes smoking a cigar. In Fine condition. As new. Member of the P.B.F.A. 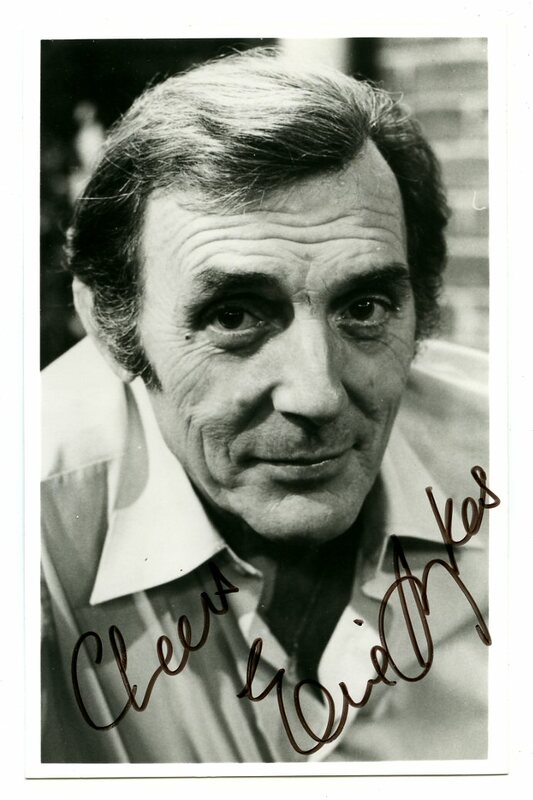 Vintage black and white SIGNED by the author photograph. In Fine condition. 5½" x 3½". Member of the P.B.F.A. 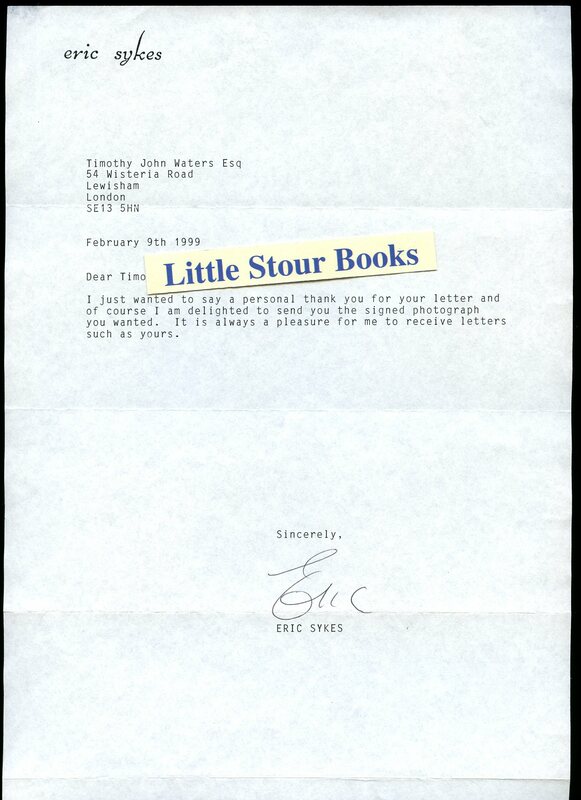 Typed letter on A4 sheet of Eric Sykes letter headed paper. 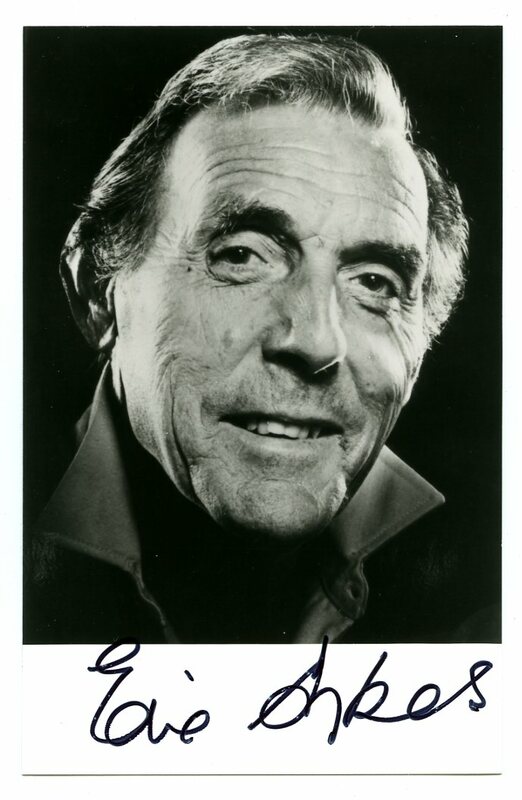 SIGNED by the author Eric Sykes. Member of the P.B.F.A.